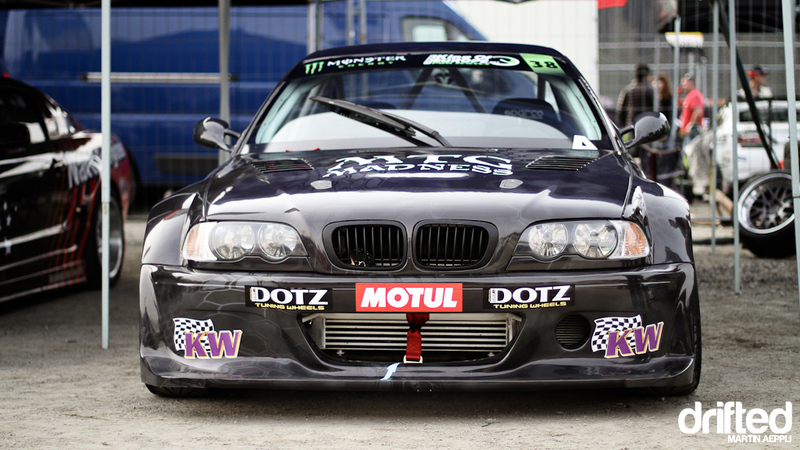 We share all of the glorious details of team Cartu Drifting’s impressive 2JZ E46. How well does a Toyota powered BMW smoke tyres? Let’s find out. In my report from Greinbach I mentioned that one of the competing cars was running a powerful 2JZ, employing anti-lag to avoid losing boost whilst off throttle. Being a bit of a tech-freak, I knew I had to take a closer look.. When I later paid a visit to where the car was parked in the paddock, I came across a very friendly bunch of people. I was able to meet the car’s owner, Josh Cartu, the driver, Adam Frank and also its chief enginneer, Szabó Zsolt. They were all very open and gladly told me everything I wanted to know about the car, which also continued after the event by mail, for which I want to thank them here right away. As it turned out, this car isn’t simply a drift project for a guy who wants to go out and have some fun. Instead it’s a well planned project, led by its owner, Josh Cartu. Josh has had quite a lot of success with his various IT companies (some of which are displayed on the car), which nowadays allows him to enjoy his many hobbies to the fullest. He’s currently training in a Ferrari 458 GT3 for the WEC FIA GT Open and has several impressive cars to enjoy on the road. Some time ago he decided to build “the fastest, most powerful and most capable drifting machine the world has ever seen”, as he puts it. This is why he founded Cartu Drifting, and started planning the car you see here with the help of Adam and Szabó and, basically, unlimited funds. Adam and his partner Efrat together run the successful MyWay Drift School and Szabó (also a drifter, competing in the Hungarian drift championship) is a very experienced builder of high-level drift cars. The car is, as I’m sure you’ve already determined by looking at the pictures, based on an E46 3-series. The exterior is enhanced by the nowadays popular Flossmann GTR body kit. The paint scheme is based on a camouflage pattern by the Kryptek Outdoor Group, which is usually used for military gear. As I’ve been told, there might also be a switch to the snow camo pattern by the same company in the future. 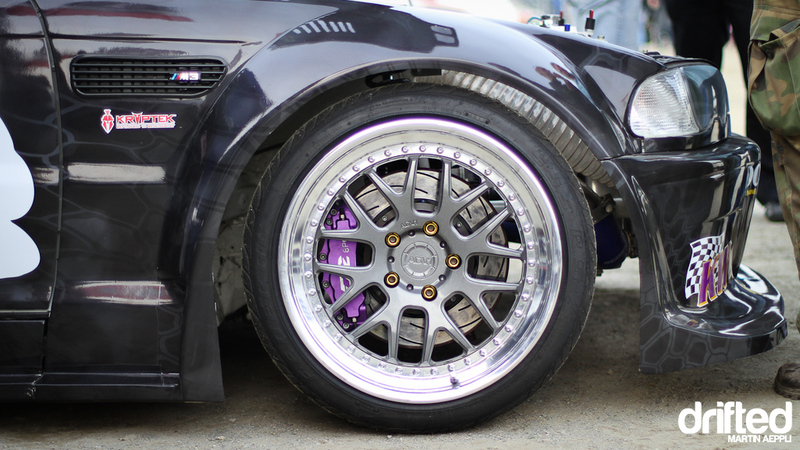 The rims are custom items by ADV.1, who make a variety of awesome wheels mostly seen on high-end performance cars. 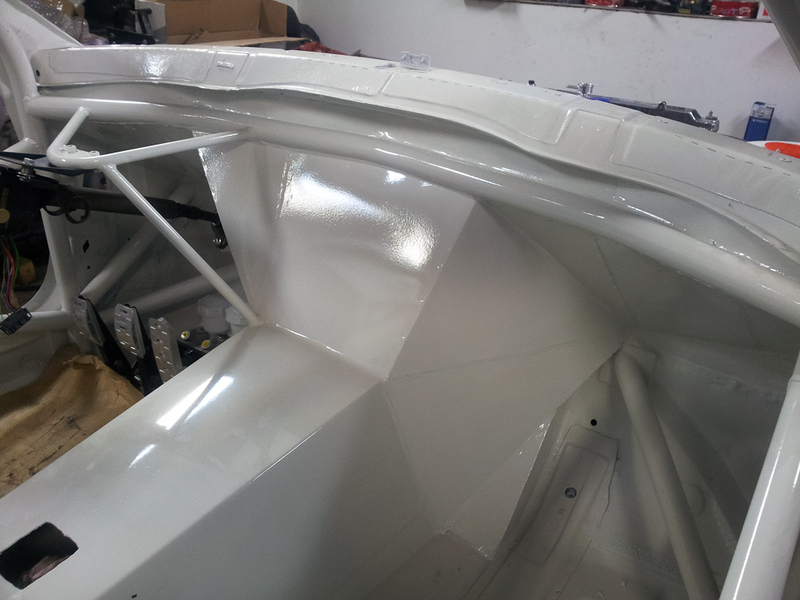 Opening a very light door with its polycarbonate windows, you’ll see a cleanly finished interior with a nice flocked dash, surrounded by a well-crafted rollcage. 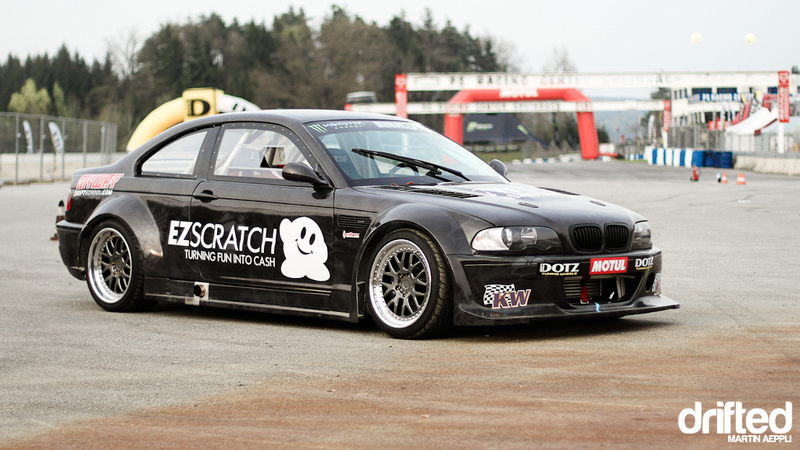 It gets even more interesting as soon as you open the bonnet; obviously the E46 chassis has undergone some major surgery at the hands of Szabó. As Adam tells me, the entire front end, the firewall and the gearbox tunnel were cut out, then the engine and gearbox were placed at the exact position for the car to have a 60/40 weight balance front to rear. 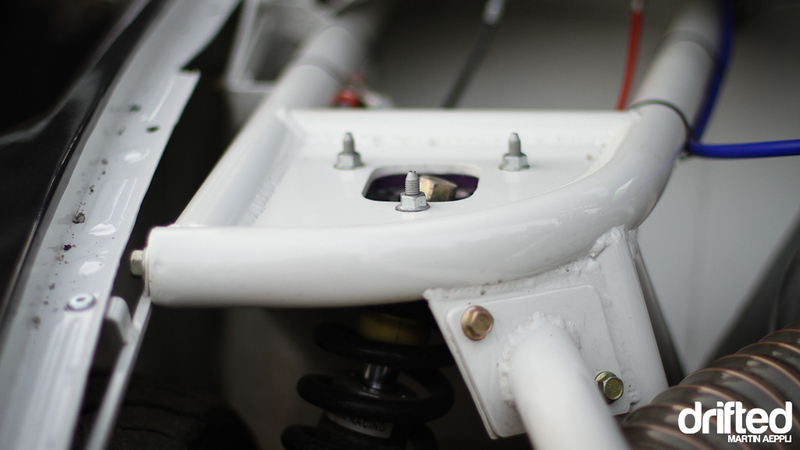 Once the location of the drivetrain was determined, all the cut chassis parts were replaced by handmade ones, including a tubular front end with new upper mounting points for the D2 suspension to create more caster and optimum camber angle. Obviously, this entire conversion also results in a substantial weight reduction; at the moment 1100kg is quoted. The above as well as the following picture were, among many others, sent to me by Frank and show the car during its build-up. The 65 degree steering angle was achieved using parts handmade by Szabó. The engine is a fully built 2JZ utilizing a Garrett GT35, currently developing about 700hp. Originally, Josh had wanted to use a fully built E60 M5 V10 for the car, but in the end they decided in favour of the Toyota straight-6 for maximum torque. The unusual thing about it is the aforementioned fact that this engine runs an anti-lag system (ALS). This has been used in rally cars for decades to keep the turbocharger spooling while the driver is off the throttle, resulting in a stark reduction of turbo lag. 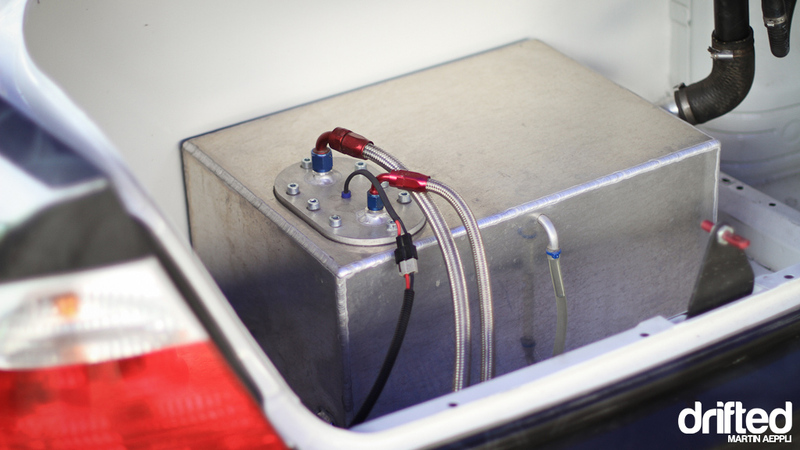 The system itself is relatively simple, requiring no major additional mechanical parts. Basically, fuel is still injected while the engine runs off throttle, and by igniting it very late, close to when the exhaust valve opens, the majority of it is burnt in the engine’s exhaust system, in front of the turbocharger’s turbine. This keeps the turbine spinning although there’s barely any engine load. Additionally, with combustion mainly happening outside the combustion chamber, it makes for a particular, very awesome sound. The reason this isn’t usually made use of in anything except manufacturer racecars is the fact that there are explosions continuously happening inside the exhaust manifold, which puts extreme stress on all the parts involved and severly increases the temperature of the turbocharger as well as the exhaust valves and their surroundings. All this means that the life expectancy of the aforementioned parts are markedly reduced. 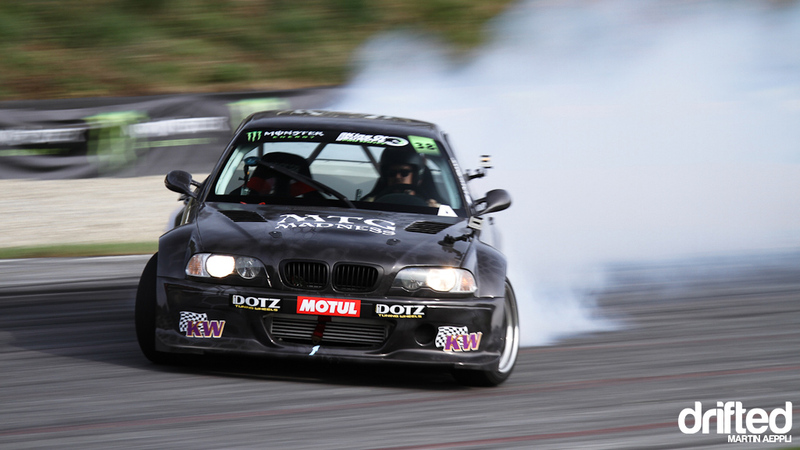 For the Cartu Drifting E46 however, money restrictions were never regarded as a valid reason not to do something, therefore the ALS is used to full effect. According to Josh, the car as it is now is “but a shadow of what [he has] planned”. Very soon, and maybe even in time for the next round of King of Europe, two replacements are going to happen. A Garrett GTX42 is planned to take the engine to its full 1000hp potential, and the Getrag gearbox is to be superseded by a sequential gearbox. For the next season, the rear end, which at present is still in its original form except for a race-spec fuel cell, will also be cut off and replaced by a tubeframe construction. Listening to the team talk tactics before battles started in Greinbach, it was clear that Josh’s approach is based on his successful career, adapted to the world of drifting with the help of some very experienced insiders. I’m very curious to see what this colaboration will lead to in the future, especially as I have it on good authority that this is not the last car they’ll build and that the next car will be something nobody has done yet. 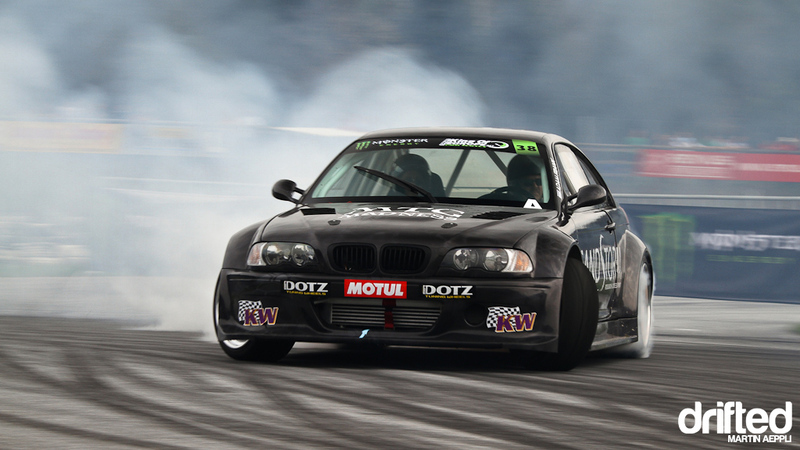 For now, the Cartu Drifting E46 in the hands of Adam Frank is definitely a very high spec drift car with a lot of potential that’s going to be a force to be reckoned with in this year’s King of Europe Championship. To learn more about Toyota’s 2JZ-GTE then why not check out our 1JZ Vs 2JZ article? To bone up on 2JZ-GTE specs then try this Wikipedia article.